This petite heart, featuring her beautifully engraved name, initial, or monogram, will be the gift that lasts long after her First Communion. She will feel so special, knowing that this pendant was custom made just for her, honoring her on her big day. With the many personalizing options including engraving font style, adorable accent charms, and an optional back engraving, you can really make it something perfectly unique. Presented in Tiny Blessing's signature gift wrapping, your gift will be remembered and cherished for many years to come. A precious heirloom, keeping this faithful day near and dear to her heart. She is a heavenly princess, and her faith will always shine as bright as gold! 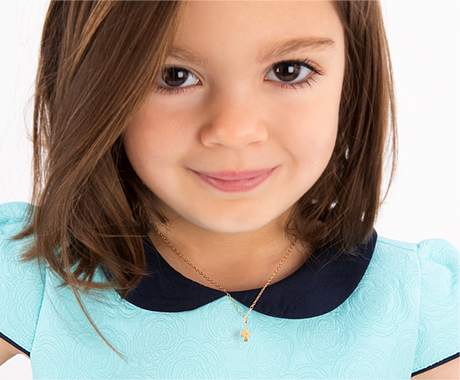 This pendant is the perfect "I Love You" on your precious little girl's First Holy Communion.